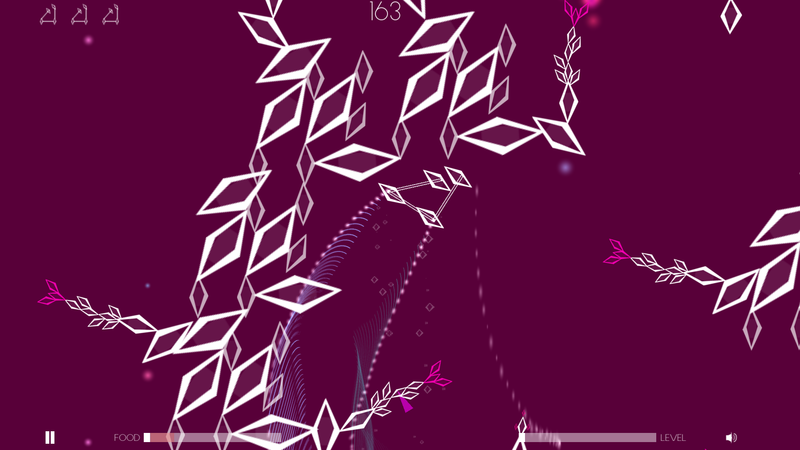 Coded  Art's latest game feels both unrefined and incomplete. Every now and then a game comes along that fills a player's head with questions. For ini, the abstract mobile title from German developer Coded  Art, a number of questions come to mind: Is this game actually finished? Who is this game for? Does the game have an ending? Why would anyone buy this? What exactly were the developers aiming for? It goes without saying that these aren't good questions to be asking, but before addressing those concerns, it's necessary to understand just what ini is. It's game, loosely speaking, that (according to the in-game tutorial) has players seeking to feed their children by collecting swarms of flies. The aforementioned children are located within a swarm-like object themselves, and floating through that swarm after having collected two flies will increase the game's timer, while ten flies will level up the "parent," or rather the loose collection of diamonds that represents the player. The game has a very simple art style that looks to be entirely based around a single diamond-shaped sprite. Essentially everything in the game's world, from the mothership/swarm thing that the player controls to hazardous plant-like objects and various spinning/flying enemy doodads floating around the environment uses the same four-sided sprite. A sort of bloom effect is used to accent the otherwise bland backgrounds, and is also used to form the "fog" that makes up the borders of each level. Flying through the fog goes to the next level, which, as far as can be told, just repopulates the stage with different hazards and a different background color. 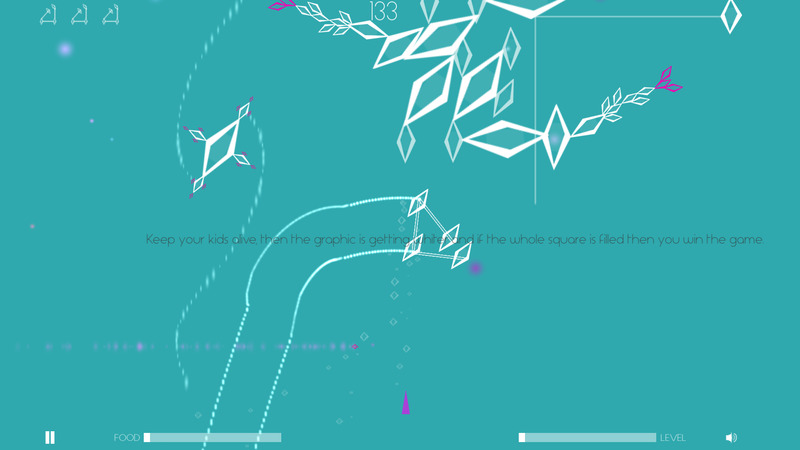 Control is very simple: the game's protagonist simply flies foward at a set rate, and the player can control the direction of flight by pressing on the left- or right-hand side of the screen. Pressing on the right rotates the ship clockwise, while pressing on the left rotates the ship anti-clockwise. At least the instructions are clear. Once players get a grasp on the game's mechanics, they'll be well on their way to having fun. Or, at least, I can only assume that's what the developer intended. With only the barest control over the ship, ini isn't a particularly demanding game. There aren't loads of flies to be found, either, and the timer will likely run itself out before players find more than about five of them. There's really no opportunity to level up, either, even though it's supposedly technically possible. So, in considering that players fly around trying to collect flies in order to increase a timer that is constantly decreasing, one must wonder: what's the point? Is this a game about filling up a timer by collecting and dropping off flies? Since players lose a child by allowing the timer to run out, and supposedly gain one by dropping off ten flies, does it really matter if the timer runs out? I can safely say that I have no idea. Even more perplexing is a "Load" option on the main screen — at no point in my time playing ini have I seen an option to save my game. I'm not sure the option exists. Clicking the Load option simply sends the player back to the opening cinematic. Simply put, ini is not a good game. It doesn't really do anything — if not for the tiny amount of control given to the player, one would be forgiven for thinking it was a screen saver or a media player visualization. It honestly feels like a tech demo — something someone created just to see if they could, and at some point down the line decided they may as well release it to the public. If I had to give the game some sort of praise, I would say that it isn't difficult. Though, speaking technically, I'm not sure the foundation of the game supports actual difficulty. It's sort of a pretty game, too, in a very basic way. The audio might not be too bad, either, if not for the shrill horror movie-type sound the home nest makes. If anything, ini is the type of game that people will see being played in a sardonic YouTube video, and even then, there will be very little to say about it, because ini offers so very little to do. This really isn't a game worth playing, not even if it were free, so it certainly isn't worth the $2.99 asking price.